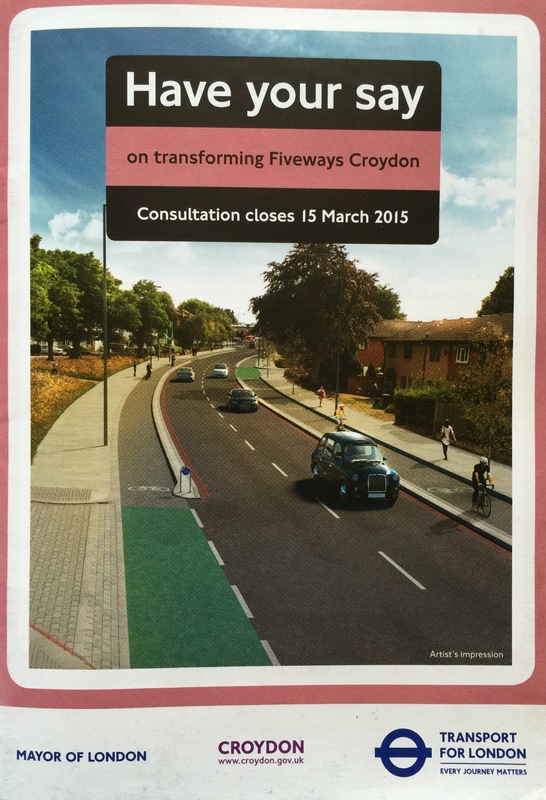 The front cover to the “Have your say on transforming Fiveways Croydon” consultation booklet (March 2015) displays an image of Stafford Road, complete with cycle paths adjacent to, but separate from, the carriageway. A wonderful sight and surely confirmation that the Mayor’s Vision for Cycling (March 2013) is on it’s way to the outer reaches of our capital city, even those boroughs that were not successful with their mini-Holland bids! Lack of detail, or lack of ambition? Fiveways is just one project (albeit a very large one) of hundreds within Transport for London’s Road Modernisation Plan, to be delivered between now and around 2022. The plan complements the Roads Task Force and the Mayor’s Cycling Vision, with a programme of delivering improvements for cycling that include the East-West and North-South Cycle Superhighways in central London (schemes that are actually being delivered during the period of the initial Fiveways consultation). The information provided for this first Fiveways consultation, outlining proposals that include improving road safety and providing new cycle lanes and facilities, does not appear to reflect the ambitions for cycling that are emerging elsewhere in London. It is not clear whether this is due to lack of detail or to a lack of ambition, or perhaps just ‘too difficult’ full-stop. If either of the two Fiveways proposals progress in their current form, there is scant evidence to suggest that the experience of cycling around, through, or to Waddon or Fiveways will be fundamentally any different post implementation than it currently is. The overriding key objective of the Road Modernisation Plan is to ensure London’s road assets are fit for the future. The question is though, exactly how far into the future? It could be argued that the proposals outlined to transform Fiveways, to increase road capacity to help meet a likely increase in traffic, could be a self-fulfilling prophecy that will be only bring about short-term benefits and may have a detrimental effect in the longer term. The decisions we make today need to consider the likely consequences that may result in thirty years time, not just in thirty months time. Past experience, over many decades, has shown that increasing road capacity without including alternative, robust, safe, and inviting proposals that will actively enable walking and cycling and other sustainable transport options, will simply generate new traffic. A new bridge at Waddon would untangle the A232 from the A23, but in doing so would almost certainly increase the volume of traffic, and cause congestion and journey time reliability issues, elsewhere. In an urban area such as Croydon, which already has an over-supply of parking, this could be very keenly felt. There could be consequences for Sutton’s retail economy too, if people who already drive to Sutton find it a lot easier to drive to Croydon instead. Rather than facilitating a growth in the local economy, it could ultimately have a negative impact. Consequently, those planning “the biggest road investment programme in a generation” need to take note from the experience of the previous generation. There is also evidence to suggest that traffic levels are declining. Figures released by the Department for Transport  show a near continuous downward trend in the total number of vehicles on major roads in Croydon between 2000 and 2012 (Figure 1). Figure 1: Relative levels of all motor vehicle traffic on major roads in Croydon 2000-2012. This would suggest that the existing road network around Fiveways could support up to 20% more traffic than it currently does, without adding additional capacity. Of course, there is likely to be an increase in the number of journeys made in Croydon in the coming year, even if trip rates are in decline, due to a rising population. Arguably this is even more reason to encourage and enable journeys by means other than by private car. The aspirations outlined in the Mayor’s Vision for Cycling, to which the Road Modernisation Plan is aligned, along with the guidelines in the London Cycling Design Standards lead the way when it comes to enabling more people to cycle. Many more people would cycle if they felt safe, and the potential for cycling is there because many car journeys are made over short distances. According to Sutton Council’s draft Sustainable Transport Strategy (October 2014), over 50% of car journeys in Sutton are less than 5km (3 miles) in length. It would be interesting to know whether such a high proportion of journeys typically being made on the roads through Fiveways are for similarly short trip distances. The route classifications of the Purley Way (A23) and Croydon Road (A232) may suggest otherwise. Nevertheless, the fact that so many journeys, borough-wide, are of such a short length would tend to suggest that a considerable proportion of the current trips made by car could potentially be made by bicycle by some people for some of their journey purposes. This switch from car to bicycle will only happen if safe and inviting conditions for cycling are provided. The benefits of a reduction in the number of car journeys would not only free-up road space, and so bring about the stated aims of the proposals for the roads around Fiveways, but would also have additional longer term benefits in terms of air quality, public realm enhancement and public health. The delivery of dedicated space for cycling is essential, and everyone will benefit from it whether they currently cycle or not. It is recognised that current road layout around Waddon Station and Fiveways is sub-optimal for all road users, or, for the want of a better term, a mess. The Fiveways interchange is nothing less than hostile for cycling. The high volume of traffic, the speed of vehicles, and multiple turning movements, all conspire against vulnerable road users here. Cycling through the intersection of the A232 Croydon Road (east-west) with the A23 Purley Way (north-south), 200 metres to the north, is also an unpleasant experience even for an experienced rider. People on foot do not fare much better. Fiveways is an inhospitable location to walk through. With its labyrinth of staggered crossings and multitudes of guardrailing, noise and fumes, it must make a walk to the shops, or navigation between distant bus stops, pretty unpleasant. It is good to know that proposed changes in the area include the street environment and that these will complement Croydon’s Councils aspiration for Fiveways to become a local centre (and, hopefully, a local centre that can be reached by local people by bicycle). Apart from the existing alignment of the cycle route LCN 75 that crosses Purley Way about 500 metres to the north of Waddon station (linking Mill Lane with Waddon Road), and a circuitous alignment the of LCN 76/77 about 800 metres to the south of Fiveways, any opportunities to avoid either Waddon or Fiveways when cycling between Sutton and Croydon are limited (Figure 2). Incidentally, it is hoped that both of these existing routes, which have not been delivered to a consistent and satisfactory standard along their entire length, will be upgraded. Figure 2: Map centred on Fiveways Corner, showing some existing signed cycle routes up to about 2km radius. The boundary between the London Borough of Sutton and the London borough of croydon runs nominally north to south, and is situated approximately 300 metres to the west of Fiveways. Sutton lies to the west, Croydon to the east. All projects that are to be delivered as part of the Road Modernisation Plan need to facilitate cycling as an increasingly attractive option for many more people, and not encourage the use of the private car. In other words, more has to be done to make it easier to cycle than is done to make it easier to drive. Whether proposal 1, which includes the construction of a bridge over the railway and thereby creating additional road capacity, is the best option in the longer term is highly questionable. Although proposal 1 removes the need for the A232 traffic to use the A23 Purley Way and Fiveways Corner, there is nothing in the consultation documentation to indicate what the scheme will actually do to improve the Fiveways Corner intersection for cyclists. There is a concern that, post implementation, there will still be a great deal of traffic, much if it fast moving and turning in several directions. The vagueness of information provided in the consultation as to the benefits and impacts on cyclists for proposal 1 continues elsewhere. There is unspecific reference to “cycle lanes and improved cycle links between Waddon and Croydon town centre”; “potential for cycle lanes on bridge”; “improvements on Stafford Road”, but these just give the impression that cycling is still considered as a nice to have, and possible add-on feature, rather than being a key component of the proposal. The provision of fully segregated cycle paths on the new bridge (A232), plus either the removal of the proposed service road on the east side of the bridge (linking with Epsom Road) or for this intersection with the service road to be signalised. The provision of fully segregated cycle paths on Duppas Hill Road (A232) continuing on the east side of the new bridge, and extending to at least the intersection with Duppas Hill Lane. The removal of the existing, and incomplete, two-way cycle lane on the south-side of Croydon Road (A232) and its replacement by two, one-way cycle paths, on each side of road along the complete alignment from the intersection with Purley Way (A23) in the east to, at least, Bridges Lane in the west. The installation of Simultaneous Green cycle signals (cycle-only phase of traffic signals, green for all directions at once) at A232/A23 intersection (Croydon Road/Purley Way). The provision of fully segregated cycle paths along the full alignment of Purley Way (A23) extending north from at least the point where Imperial Way/Waddon Way (LCN 76/77) intersects with Purley Way in the south, to at least the point where Waddon Park Avenue intersects with Purley Way in the north, but preferably continuing on to Mill Lane/Waddon Road (LCN 75; future Quietway). It is recognised that this may require compulsory purchase of land on Purley Way (A23), especially to the north of Croydon Road (A232). 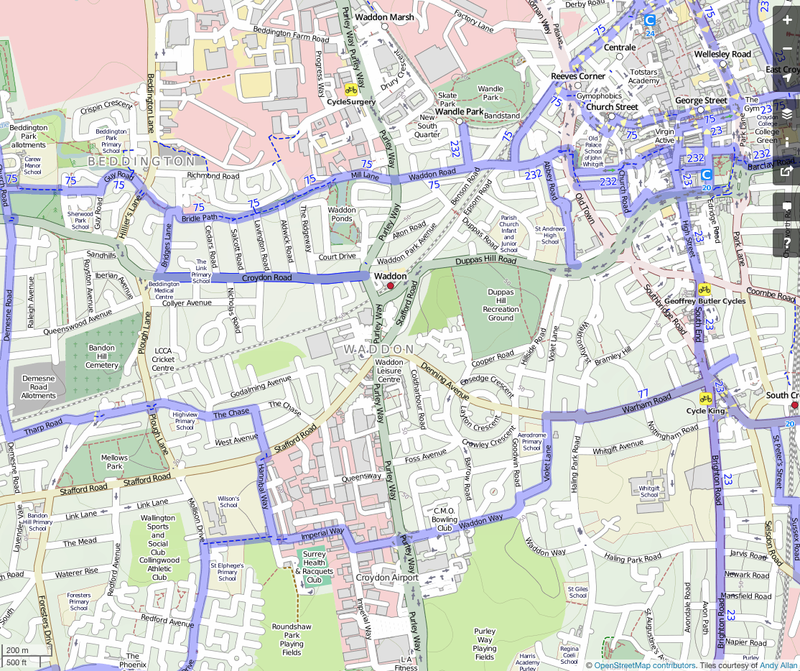 The provision of infrastructure to enable safe cycling movements on the Croydon Road (A232) > Purley Way (A23) > Waddon Park Avenue alignment. (The combination of conditions 4 and 5 would effectively enable this). The provision of fully segregated cycle paths along the B271 Stafford Road, extending from Fiveways in the east to at least the point where Stafford Road intersects High View Avenue/ Hannibal Way in the west. It is believed that condition 9 is reflected in the artist’s impression provided on the front cover of the consultation document. The lack of information provided in the consultation as to the benefits and impacts of proposal 2 on cyclists, beyond vague and unspecific reference to “improvements for cyclists on A232 and improved cycle links between Waddon and Croydon town centre”, and “improvements on Stafford Road”, does little to instill confidence that this proposal will help make cycling a transport option of choice for local people for some of their local journeys. The degree of ambition for delivery on cycling is further undermined by the fact that the artist’s impressions for this proposal, the widened A23 bridge at Waddon Station and the view of Epsom Road by the station entrance, are both devoid of cycling infrastructure. Proposals for cycling need to be far more ambitious. Consequently, proposal 2 is not supported unless the conditions numbered 3 to 9, as outlined under proposal 1, are delivered too. It will be a travesty if, in 2015, a decision is made to proceed with a major project at Fiveways in 2018/2019 that delivers an increase in road capacity but does little to enable cycling. Those driving through Fiveways in six or seven years time may not initially see it as such, but it could well be questioned by the generation to come. Both the proposals outlined in the Transforming Fiveways consultation put too much emphasis on helping to meet a likely increase in traffic and too little emphasis on how to enable a proportion of short local journeys to be more readily made by bicycle. Unless exemplary cycling infrastructure is provided at Fiveways, the outcome could ultimately undermine much of the £900million funding that is being provided as ongoing investment in cycling across London (up to 2022). London will only become a cyclised city (with all the benefits that brings, which includes reducing congestion of course), if cycling is seen as a natural, everyday, form of transport. And cycling will only be seen as a natural, everyday, form of transport if many more people consider cycling as a real option for some of their journeys for some of the time. Transforming Fiveways is an opportunity for Croydon to build cycling infrastructure that is so good, it will be the envy of the Dutch. Transforming Fiveways is an opportunity to start delivering a cycle network that is so good, when families see it from their car on their way to Croydon they will want to cycle the next time they visit. Essentially, Transforming Fiveways is an opportunity that must not be missed. We look forward to working with Transport for London, Croydon Council and Sutton Council in the hope that, together, we can help Get Sutton Cycling (and the rest of outer London too). DfT Traffic Counts > London > Croydon: http://www.dft.gov.uk/traffic-counts/area.php?region=London&la=Croydon accessed 12.03.2015. Note data disclaimer: Traffic figures at regional and national level are robust and are reported as National Statistics. However, this is not the case for road traffic at a local level. A note of this should be made when publishing these figures elsewhere and taken into account during any analyses. Between 2 February and 15 March 2015, we ran a consultation to find out views on the current situation and on two possible proposals for the Fiveways Croydon scheme. We received 799 direct responses to the consultation. Of all respondents, 81 per cent supported or partially supported the principle of a road modernisation scheme at Fiveways, 67 per cent agreed or partially agreed with Proposal 1, and 43 per cent agreed or partially agreed with Proposal 2. We would like to thank all those who gave their views. We intend to publish a preferred proposal by early 2016, with an explanation of the reasons for its selection. We will then discuss the updated proposals with key stakeholders and directly affected property owners ahead of a wider public consultation planned for autumn 2016, once we have undertaken further design and modelling work. You can find our full response to consultation online at tfl.gov.uk/fiveways-croydon. Croydon Council cabinet agree Proposal 2 as its preferred option. At its meeting yesterday, the Croydon Council cabinet agreed Proposal 2 as its preferred option for the A23/A232 intersection, part of the Fiveways Croydon scheme. More details of the meeting are available here. TfL intends to publish a preferred option in early 2016 with an explanation of the reasons for its selection. We will then discuss the updated proposals with key stakeholders and directly affected property owners ahead of a wider public consultation planned for autumn 2016, once we have undertaken further design and modelling work. TfL select Proposal 2 as preferred option. We have selected Proposal 2 as our preferred option for a scheme at Fiveways Croydon. The reasons for our decision can be found in our preferred option report. We are also proposing updated cycling facilities and a new road design at Fiveways Corner. We will discuss the updated proposals with key stakeholders and affected property owners ahead of a wider public consultation planned for autumn 2016, once we have undertaken further design work. A response to this latest consultation, for submission by 18 September 2017, is being prepared. If you reside, work or go to school or college in Sutton, we would be pleased to receive any comments you would like to share. Contact details here.